“Effectively, the vice-chancellor has decided to delay the compliance of the High Court order”, Dr Pandey, who is a Gandhian educationist and an activist, said. Dr Pandey is on annual contract with the IIT-BHU, which ends on July 31, 2016. 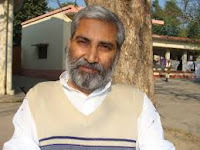 Dr Pandey believes, the entire effort appears to be to “deliberately dilly dally over my re-entry until that date, and effectively ‘use up the time of three months that he has available to appeal the High Court’s Order in the Supreme Court.” This would enable him to successfully “block my return to the IIT-BHU campus, which is probably what his intention is”, he adds. Delivering the order, Justices Mahesh Chandra Tripathi and V.K. Shukla quoted from Voltaire’s words, “I disapprove of what you say, but I will defend to death your right to say it.” It especially took strong exception to the top Gandhian academic not being given a chance to explain the serious charges levelled against him.